The Karen National Union denied reports in Burma’s state controlled newspapers that claimed that on August 8 an attack by Karen fighters had wounded two children in Karen state. Major Saw Kler Doh, an office manager with the Karen National Liberation Army in Brigade 5, based in the Papun District blamed the incident on the Burma Army. Major Saw Kler Doh said that on August 5, KNLA fighters attacked the army camp of Light Infantry Battalion 214 based near Wa Thoe Kho village in Papun district. The Major told Karen News that the Burma Army responded with heavy artilleries shells where it hit a primary school and wounded a girl, 9, and a boy, 10. Major Saw Kler Doh said. 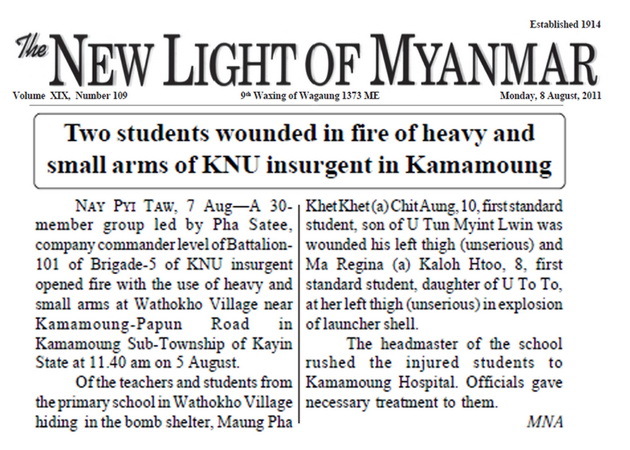 The Burma government’s newspaper stated that the KNU’s Brigade 5, Battalion 101 with 30 soldiers led by Company Commander Pha Satee [correct spelling-Phar Steel] attacked Wa Thoe Kho village with small and large weapons and shrapnel from the artillery shells wounded two first grade students from Wa Thoe Kho primary school. Major Kler Doh insisted that the Burma army soldiers deliberately fired the artillery shells that hit the village. The Major said the village was not in a crossfire position – between the KNLA and the Burma army camp – the village was behind the Karen fighters. Local sources say that the two wounded children were taken to Ka Ma Maunn hospital by Wa Thoe Kho primary school’s headmistress.